Just when you think you know a place it can reveal even more to amaze and delight. This was our experience during our family holiday in Seaton, Devon. East Devon is an area we have stayed in a couple of times so we already know about its coastline’s special status as a World Heritage Site and its great family attractions. But I was surprised to find there was still so much for us to do. If you’re a fan of vintage vehicles then you can’t miss a ride on Seaton Tramway. It’s also a great way to appreciate the East Devon Area of Outstanding Natural Beauty as the route takes you through three miles of the Axe Valley including the Seaton Wetlands Nature Reserve. You can read more about Seaton Tramway in my blog post about this attraction from a pervious visit to the area. Throughout our week in Seaton we enjoyed the most glorious views of Seaton Wetlands from our base at Manor Farm Caravan Site. This relatively new nature reserve is teeming with wildlife – some of which we got to see thanks to a tour with the team at Wild East Devon. We thoroughly dipped the pond in the Wildlife Garden, met the Dormice in the Discovery Hut and spotted Swallows, Herons and Moorhens from the hides. Entry to the Wetlands is free and you can hire pond dipping equipment for £2 or take part in organised mini-beast adventures for just a few pounds. It’s a must if you visit Seaton with kids. Be aware that dogs aren’t allowed in the nature reserve. Find out more about Seaton Wetlands. Seaton seems to be a hub for craft cafes and shops – we spotted a few during our stay. On one of the cooler days of our holiday we popped into Imagine Design Create for a morning learning the art of decopatch with the owner Kerri-Ann. As well as selling a treasure-trove of creative materials she runs regular workshops for keen crafters of all ages. The girls and I had great fun glueing brightly coloured tissue paper, glitter and gems onto paper mache animals. Our creations also made a unique souvenir from our holiday. You can either stay and craft with your kids for an hour or take a break in the cafe out back. Find out more about craft workshops at Imagine Design Create. Seaton Jurassic is a thoroughly interactive journey back in time to discover the origins of life and the Jurassic Coastline. It opened in 2016 and is pitched perfectly for families with lots of facts to find, fishy costumes to try on and games to play. The girls were particular fans of the time-ship which transported them back 250 million years (with a little help from mummy and daddy rowing the oars!). They also liked collecting stamps in their Survivor Passes to win a prize at the end of our visit. If you’re in Seaton then definitely check out this attraction. Family tickets (two adults plus two children) are £22. There’s also a lovely and reasonably priced cafe which you can visit whether or not you are going into the attraction. Find out more about Seaton Jurassic. The small village of Branscombe, just a couple of miles from Seaton, is one of Devon’s hidden gems. You get to it down some narrow and winding lanes from the A3052 – keep going, it’s worth it. At the village’s heart there are three National Trust owned buildings: the old bakery, forge and mill. The forge is the county’s oldest thatched forge still worked by a blacksmith. It doesn’t take long to look around the village so indulge yourself with a walk through the scenic valley to the beach too. Dogs are welcome here and if you haven’t aleady been tempted by a cream tea at the National Trust cafe in the Old Bakery you can get meals, snacks and cakes at the beach restaurant. With Seaton beach, Beer, Sidmouth and Lyme Regis all within a short drive we were spoilt for choice during our week in Seaton, Devon. These shingle and rock beaches bordered by red cliffs and pretty towns make for a great beach day. Pack your beach shoes and enjoy a dip in the English Channel, water sports or a wander along the promenade. Or generally goof about like the Tin Box girls do! You’ll not go far without stumbling across a cart full of locally produced ice cream or a quintessentially British deck chair to hire so you can take a load off and enjoy the view. We paused for a paddle at Sidmouth and Seaton, and hit Branscombe on such a hot day that it would have been madness not to take a dip in the clear waters to cool off. Just 20 minutes down the road from where we were staying at Seaton you can join a boat trip with Stuart Line Cruises. They offer cruises all along the red cliff and sandy Devon coast from Sidmouth to Brixham. 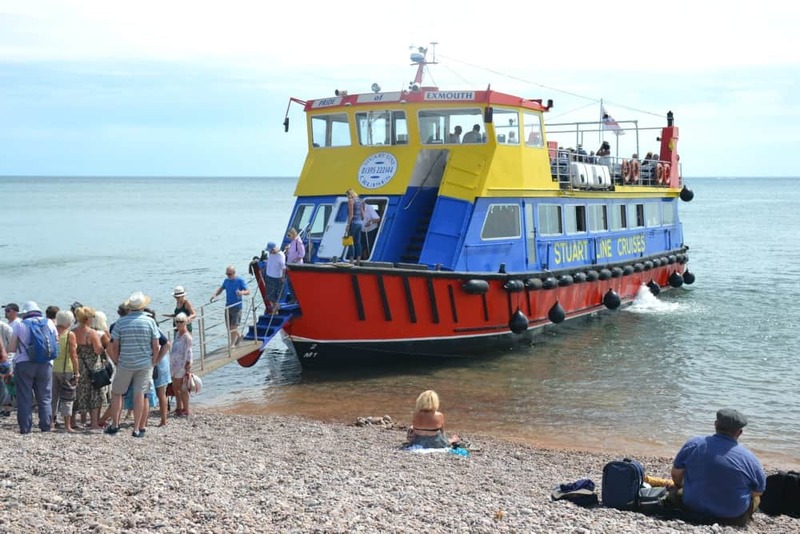 We climbed onboard the Pride of Exmouth on Sidmouth beach for a 50 minute tour of the bay which is an extraordinary part of the Jurassic Coast UNESCO World Heritage Site. There was commentary throughout the trip and the crew came around taking orders for the bar so there was no need to miss a moment of the scenery. Find out more about Stuart Line Cruises. We’ve stayed at a few campsites in and around Seaton but this time our base was Manor Farm Caravan & Camping Site. 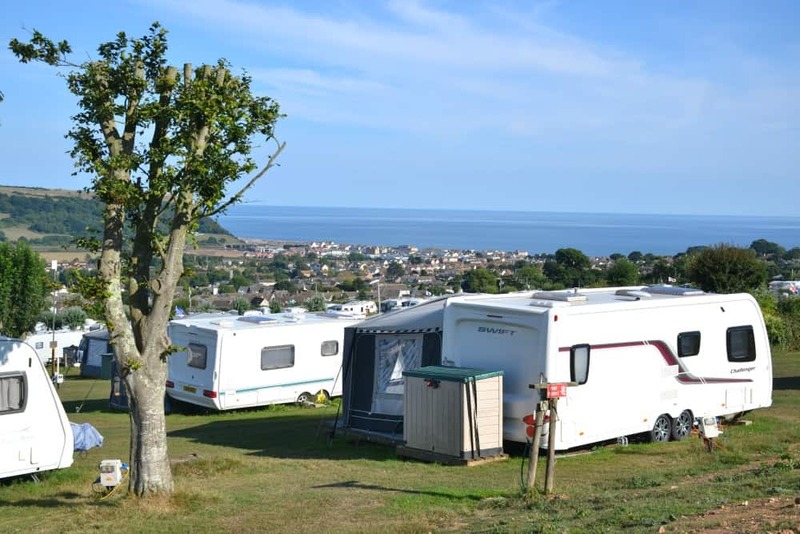 It’s an East Devon campsite with extraordinary views across the Axe Valley, Seaton and Lyme Bay. It’s also a good option for families with a large play area and Pets Corner farm. Manor Farm is located one mile from the centre of Seaton and the beach, making it an ideal base for exploring the town. Have a read of our full review of Manor Farm. Last year we stayed at Andrewshayes Holiday Park which is a touring, static caravan and glamping site just off the A35. It has an indoor pool, club house, play park and modern toilet blocks. We have also glamped at Oakdown Holiday Park which has touring pitches and static caravans as well. The site has a playground, a modern toilet block and is just down the road from Sidmouth Donkey Sanctuary. Whether you’re looking for coffee and cake after a dog walk, pub grub or an al a carte meal there are plenty of dining options in Seaton. We stopped by the dog-friendly Pebbles Coffee House and Bistro for a filling lunch after a walk on the beach. Meals range from £6.50 for lighter plates to £9.95 for something that will fill you up all day. There’s also cream teas, sandwiches and cakes if you’re popping in for a quick energy boost. I can recommend the omelette while Mr Tin Box was a fan of the steak and red onion chutney sandwich. If you have longer than a week to explore Seaton and the surrounding area then we can recommend even more things to do in East Devon like visiting Pecorama at Beer, Crealy Adventure Park near Exeter, The World of Country Life at Exmouth and Wildwood Escot at Ottery St Mary. Have you visited Seaton, Devon? What would you recommend adding to this list? Disclosure: we were guests of Visit Seaton and received complimentary access to some businesses and attractions in exchange for coverage on the blog. All opinions are my own and those of my family. Crew taking orders for the bar, so you don’t have to leave your seat on the cruise? Now that really IS good service! I knew nothing about Seaton before reading this post, but it sounds like somewhere I’d love to visit with the kids. Well worth a visit to Coastal Crafts Collective. Good selection of art and craft items from local artists… and a programme of workshops to suit all ages. Thanks for the extra suggestion Ivor! So much to do! How cute is that tram? But it looks like there’s enough to keep little ones entertained even if the weather turns. And that campsite is quite a find! Claire it looks so beautiful, I so want to visit we keep saying we will but never get there. And now we have the surfing bug there is no stopping us. Oh I love all these ideas! The Seaton tramway looks great fun, and my girls would be all over the crafting at imagine design create! I love the beaches too they are stunning Claire! It is a gorgeous part of the world. The crafting was great fun and there’s brilliant views in every direction! Oh wow what a week you had Claire! The tram looks great fun and the scenery from the boat tour is spectacular! What a pretty corner of England and so much fun stuff to do. My oldest has been reading about the Jurassic coastline and Seaton Jurassic sounds like a great way to enjoy and explore it. Personally, I love the look of that tramway! So much to do! It’s amazing what you can find tucked away in the unlikeliest of places. Looks like you had a fab little break – your girls look like they had a brilliant time! These ideas are perfect. We loved Seaton Jurassic when we were in the area and the tram was so much fun. You’ve also given me a few reasons to go back too! Zena’s Suitcase recently posted…Test Driving the New Ford Focus – A Good Family Car?